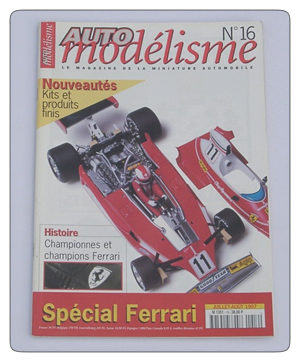 Issue 16 of the French language model car magazine, Auto Modelisme. Each issue is full colour and printed on high quality glossy paper, and has features on die-cast cars, resin kits, Le Mans, motorcycles, historic racing cars, real cars, computer games, slot cars, building kits, reviews and many other model car related things. The cover car for this issue is the Ferrari 312T. We will ship worldwide..UK Postage is £2, Europe is £4, America and Canada £5..all other Countries please email for a quote.